TROY DEENEY WILL face no formal punishment after directing a middle-finger salute at Chelsea fans during Watford’s 4-1 win over the Premier League champions on Monday. “Watford’s Troy Deeney will not face any formal action following his goal celebration during the game against Chelsea on Monday 5 February 2018,” read an FA statement. “Video footage was referred to a panel of three former elite match officials who were asked to consider independently whether it was a red card offence. 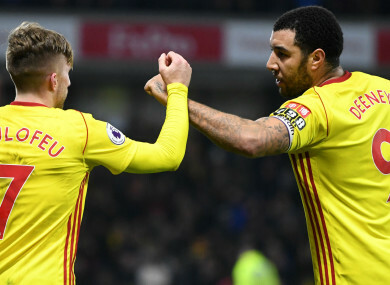 Deeney has already been disciplined on two occasions this season after receiving a retrospective three-game ban for raising his hands to Joe Allen’s face against Stoke City in October, while he was sent off for a poor challenge on Huddersfield Town’s Colin Quaner in December, earning a four-game suspension. The 29-year-old striker now has three goals and two assists in 17 appearances this season for Watford, who sit 11th in the Premier League table after Monday’s win. Email “Troy Deeney facing no disciplinary action for middle-finger gesture to Chelsea fans”. Feedback on “Troy Deeney facing no disciplinary action for middle-finger gesture to Chelsea fans”.